No One Has Ever Led the Pack Like Mississippi's Brett Favre. - Mississippi Believe It! 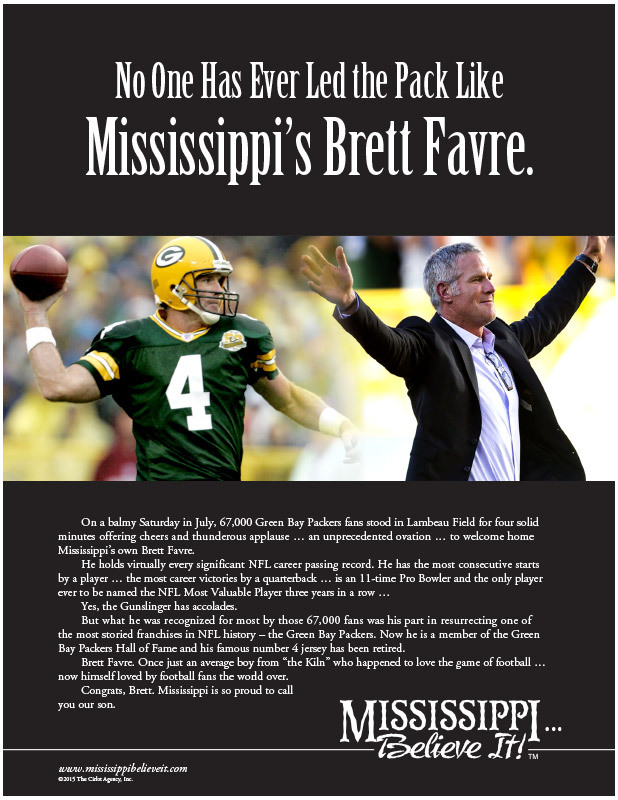 Home » Resources » Campaign » No One Has Ever Led the Pack Like Mississippi’s Brett Favre. On a balmy Saturday in July, 67,000 Green Bay Packers fans stood in Lambeau Field for four solid minutes offering cheers and thunderous applause … an unprecedented ovation … to welcome home Mississippi’s own Brett Favre. He holds virtually every significant NFL career passing record. He has the most consecutive starts by a player … the most career victories by a quarterback … is an 11-time Pro Bowler and the only player ever to be named the NFL Most Valuable Player three years in a row … Yes, the Gunslinger has accolades. But what he was recognized for most by those 67,000 fans was his part in resurrecting one of the most storied franchises in NFL history – the Green Bay Packers. Now he is a member of the Green Bay Packers Hall of Fame and his famous number 4 jersey has been retired. Brett Favre. Once just an average boy from “the Kiln” who happened to love the game of football … now himself loved by football fans the world over. Congrats, Brett. Mississippi is so proud to call you our son.